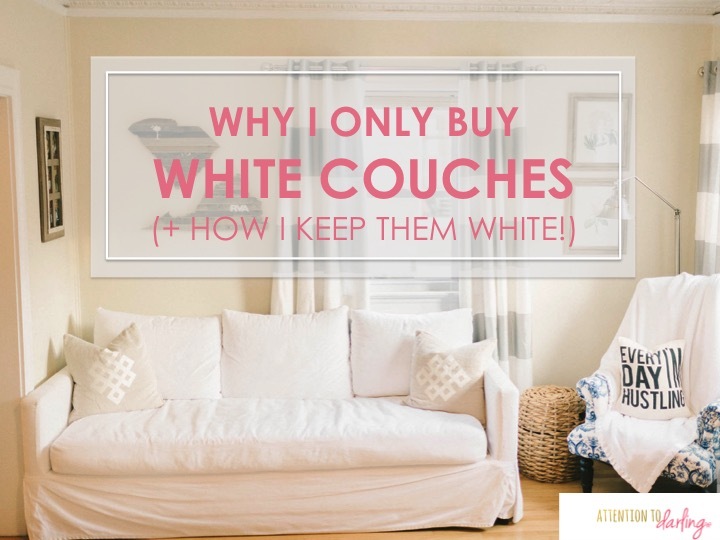 Y’all, you heard it here, I will only ever buy white couches for the rest of my life! And I’m saying this as the Mama to two big, stinky, dirty dogs and one very messy tiny human. Not to mention my husband :). Ok, and let’s be real I’m probably the clumsiest of us all (hello red wine spills!). 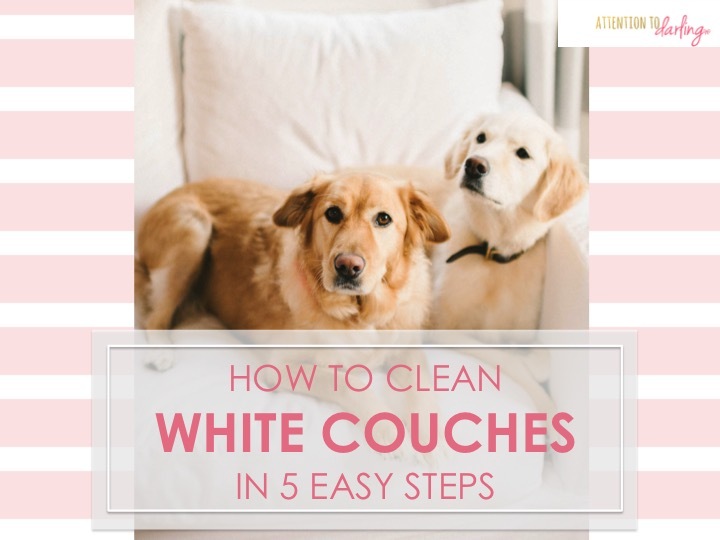 Call me crazy, but here’s why I only buy white couches, plus how I keep them clean. You want to be able to pop off every piece of those babies and just throw ’em in the washing machine. One word: Bleach. This is how you keep white furniture gleaming and you want a pure white so its bleach friendly. I wash my slipcovers all the time, so they need to be able to hold up against lots of washes. I love my one big cushion on the seat and only three back cushions on my couches because it reduces the time it takes to wash everything. Plus, I hate getting stuck in the crack of a couch during Netflix marathons :). Bonus: I love down and you can get the option on some couches to have a down layer on your seat and then down back pillows too. So comfy! We went with the Catalina Sofa from Pottery Barn. We waited awhile for them to go on sale during their upholstery event plus we had 15% off for our recent move. We chose the White Twill fabric because it’s like a pair of khakis and washes easily. We chose the Down Blend option as mentioned in the bonus above. In total, I think we spent around $1200 per couch. I would recommend going into the store to place your order, the designers there were so much help and I got a deeper discount! Note: It looks like they no longer carry this style couch, here’s the guide they had when it was around. Here is a similar Pottery Barn sofa and then I like this one, this one, and then this is the holy grail of sofas in my mind. Now, once you find your couch, how do you keep it clean?! I like to wash my three back cushions, plus the seat in one load. Then I do the full cover that is the couch itself separately. 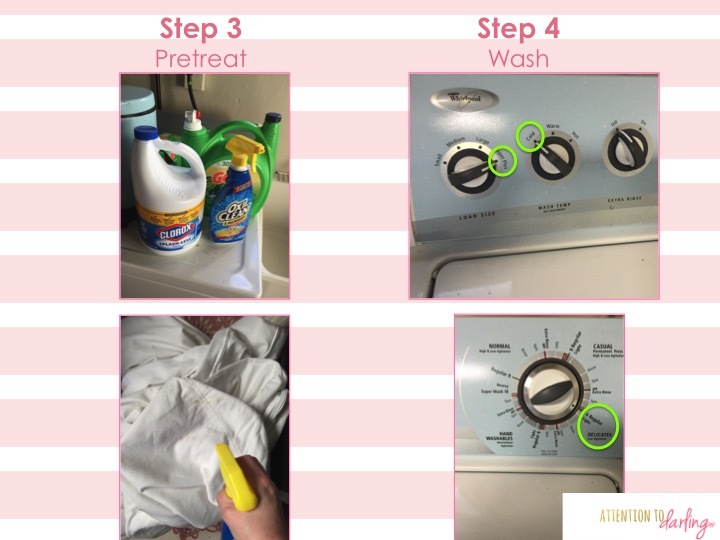 This step is important because there are lots of loose strings on the inside and they will get caught on the washer or be uber tangled if you decide to use the dryer some (more on this below). This is where you get all your stains out. 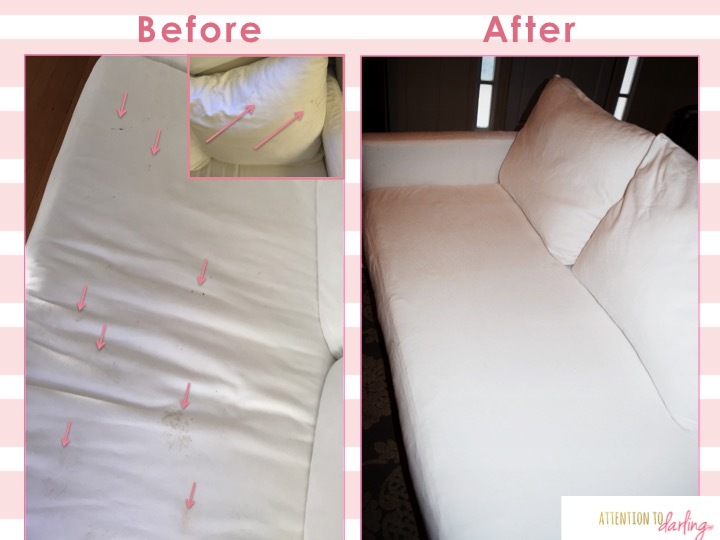 I use OxiClean Laundry Stain Remover to pretreat the cushions. I do think its key to rub in the remover and let it sit a little before washing. Sometimes I throw a little bit of the OxiClean in the washer for good measure too. I set my washer on the highest load (super plus in my case), put it on cold and do my highest delicate wash (regular for me). Don’t forget to pour in a full cup of bleach! I like the splash-less kind. Sometimes I’ll wash them a second or third time if certain stains aren’t coming out right away. Just remember, once you put something in the dryer, a stain is pretty much set. I rarely throw my slipcovers in the dryer. What I usually do is enlist my hubby to help me stretch out the seat cushion and then I throw it over the line in our laundry room or across some chair backs. I then grab it when its just damp and put it on the couch still a little wet. This helps it stretch more and fit best. 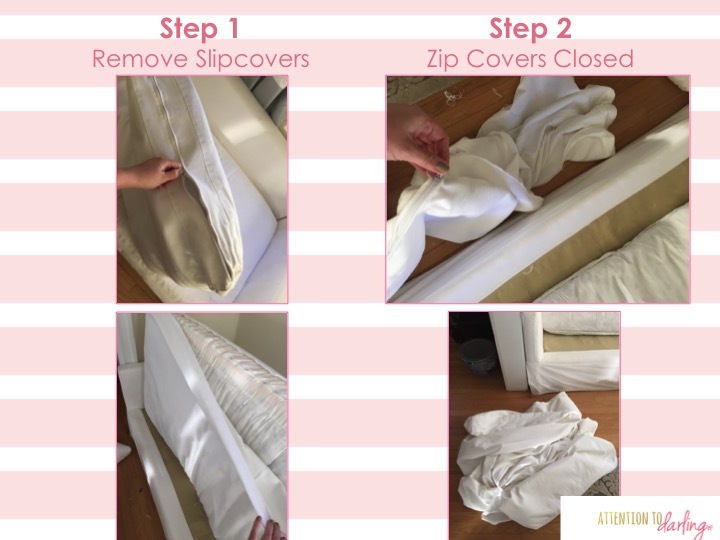 If you do need to put it in the dryer to speed things up for guests or a party for example, do it on air fluff and only for a little while, try not to use a lot of heat. 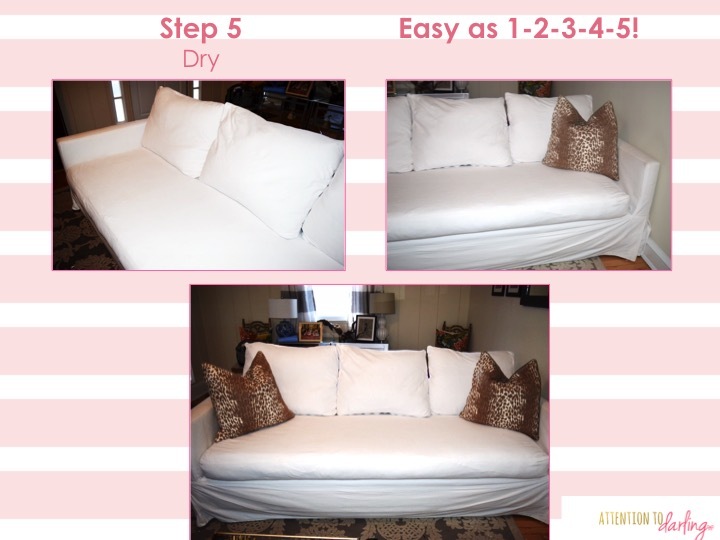 That’s it you guys, just 5 easy steps to keeping your couches clean so you can enjoy them for years to come! The “before” picture above was taken right after the dogs came in from the rain and jumped on the couch, it is actually what inspired this post! See how bright white it is in the “after” picture?! So what do you think, are you hooked on white couches now? Let me know in the comments, and feel free to ask questions! SO Obsessed Sundays – Round 2!